Kuala Lumpur, Malaysia (23rd February, 2016) — ASUS Malaysia today announced RT-AC5300, an ultra-high-performance AC5300-class tri-band wireless router, with Broadcom NitroQAM technology that delivers the world’s fastest combined Wi-Fi data rates of up to 5334Mbit/s. 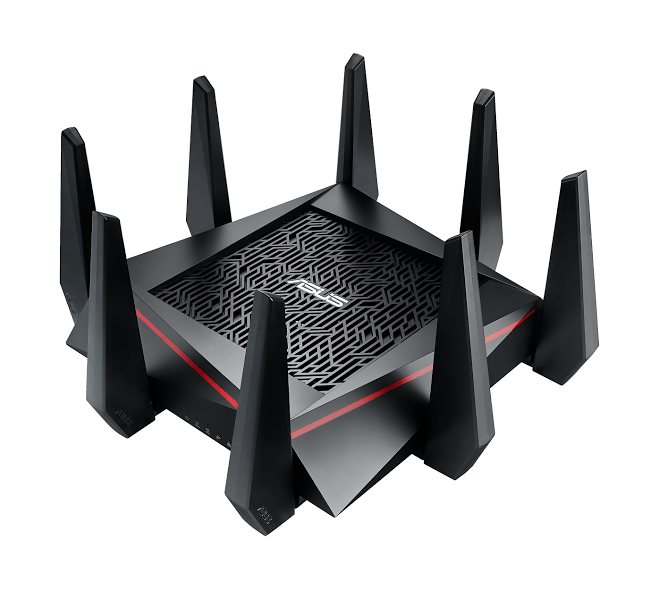 Designed as the ultimate state-of-the-art router for enthusiasts and gamers, the futuristically-styled RT-AC5300 uses a 4×4 (4-transmit, 4-receive) MIMO antenna array on all three bands. Combined with AiRadar universal beamforming and Tri-Band Smart Connect, RT-AC5300 provides outstanding multi-device performance, with super-wide coverage. For the smoothest-ever online gaming, RT-AC5300 includes an exclusive built-in game accelerator powered by Gamers Private Network (GPN) from WTFast, which significantly reduces ping times and latency for an unrivaled experience in virtually all competitive multi-player online games. The stunning better-than-wired speeds of RT-AC5300 will be a boon to any gamer needing the freedom and convenience of Wi-Fi, with the reliability and performance normally associated with a wired network. The world’s fastest Wi-Fi speeds, delivered to more devices! Increasingly, the available wireless bandwidth in a household has to be shared between a large number of Wi-Fi-enabled devices, including laptops, smartphones, tablets, smart TVs and smart home devices. To provide additional bandwidth for these multi-device households, RT-AC5300 uses a tri-band AC5300-class design, with two independent 5GHz frequency bands and one 2.4GHz frequency band. Broadcom NitroQAM technology boosts the maximum speed of each 5GHz frequency band from the standard 1734Mbit/s to a blistering 2167Mbit/s, and on the 2.4GHz frequency band speeds are increased speeds from 800Mbit/s to 1000Mbit/s for a world-leading combined throughput of 5334Mbit/s — over five times (5X) the bandwidth of a wired Gigabit Ethernet connection. This extreme bandwidth means that the advanced RT-AC5300 provides users with more than enough capacity to deliver low-latency online gaming, smooth streaming of 4K/UHD videos and ultra-fast file sharing to all connected devices. Enhanced Coverage, For Every Device, Everywhere! For outstanding multi-floor and multi-room coverage, ASUS RT-AC5300 uses eight detachable dual-band external antennas in a 4×4 MIMO array, with ASUS AiRadar universal beamforming providing unrivaled multi-device performance and wireless signal coverage. AiRadar focuses the Wi-Fi signal on a device to improve performance, stability and range. ASUS RT-AC5300 includes an exclusive built-in client and a free subscription to WTFast that gives users the very best online gaming experience — at no extra cost! WTFast uses GPN, a dedicated global private network, which automatically gives users the lowest ping times and reduced latency — critical network parameters in online games — for smooth, uninterrupted gameplay. The game accelerator is integrated into RT-AC5300’s easy-to-use ASUSWRT graphical user interface, so it consumes no system resources on the game device. This also means that the benefits can be experienced on any gaming platform — including Windows, Mac OS, Linux and game consoles — regardless of the manufacturer or operating system. ASUS RT-AC5300 features many state-of-the-art technologies to enhance performance and improve stability even on the busiest networks. Tri-Band Smart Connect technology intelligently selects the optimum frequency band for each device, based on the device’s speed, its signal strength, and how busy each band is. This means users never have to decide which band to use, as RT-AC5300 does it all automatically. The result is better range and faster, more reliable connections — all the time! For advanced users, Link Aggregation (802.3ad) support provides a way of combining two of the Gigabit Ethernet LAN ports into a single ultra-fast 2Gbit/s wired connection (using two network cables). This feature, normally only found on professional-grade network switches, will be of particular interest to users with high-speed network-attached storage (NAS) devices, which increasingly offer 802.3ad support. This means that users can fully exploit the capabilities of the latest NAS devices, for fast device backups and file sharing. The ASUS RT-AC5300 is available for purchase at the recommended retail price of RM 2,199 (~US$ 519), inclusive of GST.